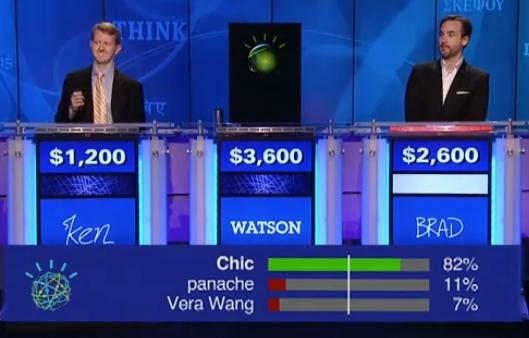 IBM's Watson takes on Jeopardy champs and wins. IBM's publicity-hungry supercomputer, Watson, is being trialled at IP Australia in a bid to develop a world leading IP system that builds prosperity for Australians. The highly intelligent cognitive computer is being tested over 12 weeks at IP Australia. It is hoped Watson will help the organisation improve agency efficiencies and enhance online service offerings for innovators. Watson is capable of answering questions posed in natural language and famously beat human competitors on US quiz show, Jeopardy. IP Australia director general, Patricia Kelly, said trialling the Watson tool launches IP Australia’s journey into the field of cognitive computing. “It is exciting for IP Australia to explore these opportunities to improve how we deliver efficient, timely and high quality services to the public. She said by exploring new opportunities, the organisation could lead the global IP economy in a revolutionary digital transformation to develop a world leading IP system that builds prosperity for Australians. “IP Australia is committed to promoting best practice online solutions for innovators," she said. "This initiative builds on recent achievements to the agency’s online accessibility and significant growth in the eServices channel, which receives over 97 per cent of all customer transactions. Already in use in the medical research sector, finance and banking, international education and travel and hospitality services, IBM Watson can analyse a broad range of disparate data and provide responses with intelligent reason. Watson works by consuming vast amounts of information to provide insights to people by answering questions. Watson learns from its interactions with people, creating a profile of the user based on stated, observed and inferred preferences and experiences. Last year, Watson was deployed at ANZ Bank to help answer customer queries and enhance the quality of data available to customer service teams. Kelly said Watson promised a new era in computing capabilities. "During this 12-week engagement different applications in IP Australia will be considered," she said. "We will develop a working prototype of a user scenario to demonstrate how the tool can benefit IP Australia’s working environment in the future”, Ms Kelly said. According to a company statement, the engagement is part of IP Australia’s commitment to deliver innovative approaches to assist IP rights holders and inventors.